*Formerly associate member of the European People’s Party (until 2012). The Democratic Party of Serbia (Serbian: Демократска странка Србије / Demokratska stranka Srbije, Serbian abbreviation: ДCC / DSS) is a national conservative and Christian democratic political party in Serbia. Founding members of the party were Vojislav Koštunica, Vladeta Janković, Đurđe Ninković, Draško Petrović, Mirko Petrović and Vladan Batić. The founding assembly was held on July 26, 1992 and elected Vojislav Koštunica as its first president. The first party assembly was held on December 5, 1992 and adopted the party’s first manifesto. The DSS first competed in the December 1992 parliamentary elections. As part of DEPOS, the DSS received 18 seats in the National Assembly of Serbia – which grew to 20 after non-party-aligned members of DEPOS decided to leave the Parliament. Soon, similar differences of opinion over ways in which to fight the Milošević regime and the approach to national issue that led to division in DS, appeared in DEPOS too. The DSS left the coalition in mid-1993. Next parliamentary elections in Serbia were called prematurely for December 19, 1993. This time DSS ran independently and received seven seats. This was a period of the party’s political stagnation as it did not have enough seats to significantly influence matters in Serbia and was left without representation in the Federal Assembly. In the 2003 parliamentary election, the DSS won 17.7% of the popular vote, translating into 53 seats in the parliament. Of these 53 seats, three went to the People’s Democratic Party (NDS), one to the Serbian Liberal Party and one to the Serbian Democratic Party (SDS). 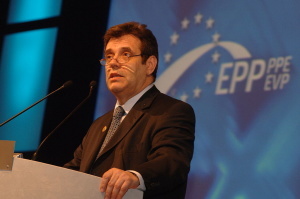 The party left the European People’s Party in February 2012.